Our mission is to AdvoCATe, EduCATe, promote awareness, and adoptions for the cats of the Alaskan community and the people who care about them. Alaska’s KAAATs is a registered non-profit and all of our services are free. Donations are accepted and are tax-deductible. Alaska's KAAATs, Kitty Advocacy, Awareness & Adoption Tails, began as a Facebook page that Paw-Prints, Howls and Purrs created to advocate for the cats of our Alaskan community back in 2013. As time went on, our page began to grow worldwide and was being recognized for the exceptionally beautiful cats, uniquely written and individualized backgrounds for each cat. Therefore we felt our page should become more and decided our next goal was to become a part of a registered 501(c)(3). We were hoping to integrate Alaska’s KAAATs into our other organization, Mojo’s Hope, however the state would not allow that, therefore we had to move forward as a separate entity. As of July 22, 2015, Alaska's KAAATs officially incorporated with the State of Alaska and we filed for our 501(c)(3) paperwork with the IRS. We officially received our letter of determination on 8/12/15, with our acceptance date of 7/22/15. Alaska's KAAATs is not a shelter or a rescue, we are volunteers that aim to promote Advocacy, Awareness, Adoptions and Happy Kitty Tails for cats in our Alaskan Community and show support of our feline friends throughout the world. We are so grateful for all of the support, shares and likes of the cats we share on our Facebook page. We help share the cats of our community in the most positive light possible. Some of the cats are available for adoption at local shelters, others are in foster with various rescue groups, including groups I volunteer with. Our main goal is to provide education, advocacy and support for the cats and the people of our community. One of our other goals is to provide beautiful photos that represent the cats spirits and purrsonalities in hopes of helping them connect with the PURRfect homes. We only take photos that are stress free for the animals, as we want their stay at the shelters or in their foster home to be healthy and happy. Their needs are always our top priority. We hope you can see the love in their hearts through their eyes and antics. The photos taken by PPHP are done with lots of TLC as each fur angel needs to be presented in the most beautiful way possible, representing each PURRecious spirit, PURRfectly. PURRmoting a sense of positive collaboration amongst the Cat Community worldwide. Supporting others, demonstrating compassion, kindness and insPURRing others to recognize the beauty of our feline friends. cats stay in their homes by providing support for the cats and their people. -Are you Ready to Adopt? -AdvoCATing for the implementation of TNR in Alaska (it is presently not legal due to a regulation with the Board of Game). -PURRtography of cats in shelters and in foster. Paw-Prints, Howls and Purrs© is my photography business that focuses primarily on capturing photos of cats in the most beautiful and fun way possible to help promote their adoptions. -Sharing of other organizations and shelters throughout Alaska to help promote positive adoptions throughout the state. As a life-long animal lover, volunteering, advoCATing and working in animal welfare for over 20 years, I have been passionate about what can be done to help these animals, in the most positive and beautiful way. I have always enjoyed photography, however I did not realize the impact it would have on the lives of the animals I have met through different outreach visits, those that I interact with daily and those who are looking for homes. Working with homeless animals provided me with the opportunity to apply my skills to capture their beauty and promote adoptions. I strive to represent each animal in a very positive way, reflecting their true purrsonalities, a "force free" method of PURRtography so that their adopters can imagine them happy & healthy in their loving home. Each animal shows their true spirit, despite the circumstances they are in or coming from. Each precious fur angel shows how to persevere, how to overcome challenges and how to let things go. It is their resilient and beautiful nature that I strive to represent in each and every photo. They teach me so much day in and day out. I feel very fortunate to have these opportunities to help animals in need. Our Alaska's KAAATs Board of Directors! Linda Lewis is our Vice-Chair/President: Has been a integral part of both Mojo's Hope and Alaska's KAAATs. She is a lifetime animal lover who currently has one dog named Miller and Mojo's Hope foster cat, Bogart. She and her husband are tremendously compassionate, thoughtful people who help us to advoCATe for the cats of our community. Heather Lewis is our Secretary and is a lifetime cat lover. She has also fostered mom cats with their babies while helping them to find them loving PURRever homes. Margaret Morandi is our Treasurer. Her cat Pooter was adopted from the adoption center our Chair-purrson used to work at and where we first met Margaret. Cats are a passion to Margaret and she does so much to help out in quiet, yet impactful ways. She volunteers with different organizations. These wonderful ladies are amazing advoCATes for cats! We are so grateful to have them on our board and we will continue to work together to continue the wonderful impact Alaska's KAAATs has for the cats of our Alaskan community and cats worldwide! Put your paws together and give us some high paw pats, we have some PURRtacular Mews to share! Alaska's KAAATs is always on the search to expand our knowledge and to be able to provide further behavioral support for the cats of our community and their people. Therefore our founder/president pursued the rigorous program through the, IAABC, The International Association of Animal Behavior Consultants (https://iaabc.org/). We are very happy and humbled to share that as of December 17, 2017, she has been accepted into the program and is now an Associate Certified Cat Behavior Consultant. Our goal with this certification is to continue to build our knowledge base and to be a local resource for various cat behaviors. Alaska's KAAATs founder has worked with a variety of behaviors over the past 20 years, however, we specialize in shy, unsocialized and fearful cats. Alaska's KAAATs also offers support for transitions into the home (before and after adoption from the local shelter or rescue group), support for adopters before and after adoption, lost cats and more. We have created user friendly brochures that are on our website, www.pawprintshowlsandpurrs.org for our local community along with educational videos, with plans to make more to further help in the best way possible. We are very excited to go on this journey and to continue to learn more ways to help out our feline friends. We are so grateful to all of our friends who support cats all over the world! We adore and treasure each one of you. 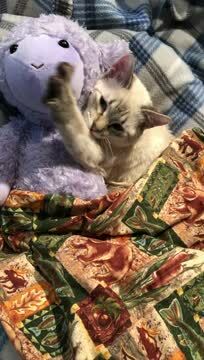 We accept donations of stuffed toys as “Comfort Companions” (via Mojo's Hope) for the cats at the shelter and in foster. Many folks have plush animals and most charity programs will not accept opened or used stuffed animals for children, but we can always give them a new life. "Comfort Companions" are simply stuffed animals that are donated for the use of offering a sense of peacefulness to the cats at the shelter and in foster. After volunteering and working in a variety of environments involved with Animal Welfare over the past 20 years we have witnessed many sick or shy animals that were so comforted by having a "friend" to snuggle up with. These "Comfort Companions" offer such a simple pleasure that truly helps the well being of the animals we meet. They get to take these "friends" with them and sometimes they hold onto them forever. Please visit Amazon.com to see the items on our Wish List. Alaska's KAAAT's is not a rescue or facility, however we provide supplies and more to the cats at the shelter and those in rescue/foster. There you will find invaluable links and support. Alaska's KAAATs is a local resource for various cat behaviors with over 20 years of experience in the Animal Welfare community. Shannon Basner has worked with a variety of behaviors, however she specializes in shy, unsocialized and fearful cats. AK's also offer support for transitions into the home (after adoption from the local shelter or rescue group), support for adopters after adoption, lost cats and more. AK's created user friendly brochures on our website for our local community along with educational videos. Our mission is to promote advocacy, awareness and adoptions for the cats of the Alaskan community, including but not limited to cats at open admission shelters. Shannon Basner also received her dog training certification through the Animal Behavior College.